The kitchen is the heart of the home, but it can also feel like The Chore Room. Prepping is a chore. Cooking is a chore. Cleaning up is a chore. (Eating is awesome, though!) We’ve all spent hundreds on devices that are supposed to make the work easy. So which ones are truly worth their space in your drawers and on your counters? Our food editors weigh in on the items that earn their keep. The food processor deserves all the real estate it takes up. Leave it on the counter, and follow these tips to ensure you use it: (1) Keep the chopping blade and the shredding disk handy. When they’re nearby, you’re more likely to remember to shove veggies and cheese down the chute. (Save your arm strength for more important things!) (2) Invest in a mini-chopper bowl (if your machine didn’t come with one) that lets you chop a tiny portion of food. If you process small amounts in the regular bowl, food will just get flung against the walls, away from the blade. Don’t be afraid of this razor-sharp tool! It makes slicing so easy. Some models have changeable blades, but a fixed blade is great for everyday slicing. A mandoline is faster than a knife and keeps slices a consistent thickness, so they all cook evenly. Plus, you can slice right over a bowl or pot or serving dish, no cutting board needed. Our pick lets you choose among three thicknesses for more versatility. Forget mincing sticky cloves: Grate your garlic. The Microplane grater is a winner for that option alone, but it’s handy for ginger, chiles, hard spices (like nutmeg and cinnamon), cheeses and chocolate as well. You can also perfectly zest your citrus while leaving bitter pith behind. It’s fast to use and easy to clean. Use the mandoline, microplane, and an electric multicooker in our Instant Pot Slow-Cooked Honey-Ginger Pork. Not just an infomercial gadget, the spiralizer makes it easier—and less boring—to eat vegetables. Think beyond subbing for pasta: Raw veggie noodles make a great salad base. And the thinness means hearty veg (like sweet potatoes and beets) cook faster when roasting or sautéing. 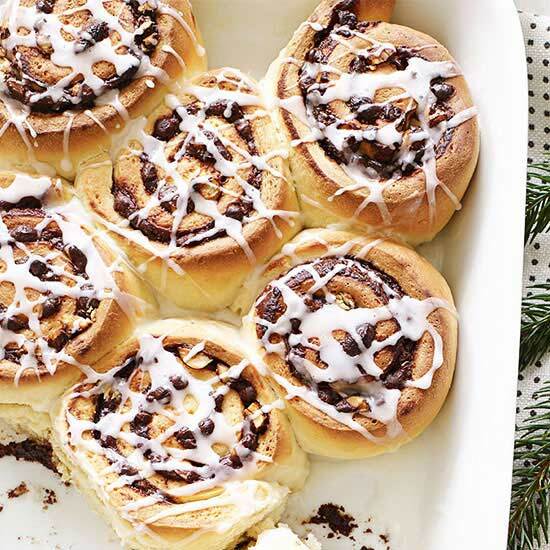 If you love to bake, yes. The locked-in bowl and locking arm make it easier to cream butter and sugar and work a stiff dough. If baking isn’t your thing, a hand mixer is a better, cheaper and more compact option. It will get you through batters for years. A blender is worth your time and money because it helps you get the finished meal on the table. 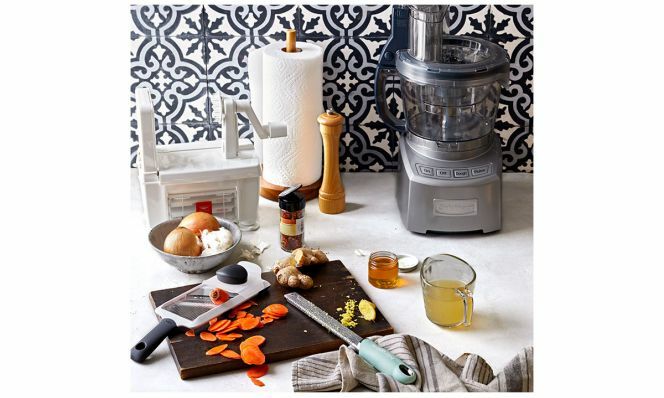 You can easily produce soups, smoothies and shakes (as well as the occasional margarita). And it’s great for making super-fast, versatile sauces that will elevate even simple dinners (see page 44). Romesco In a dry skillet over med-high, toast 4 cloves garlic, sliced, and 1 cup sliced almonds until golden in spots, 10 min, stirring frequently. Add to blender with one 16-oz jar roasted red peppers, drained and liquid reserved; 1 slice white bread, toasted and cubed; 2 tbsp tomato paste; 1 tbsp sherry or red wine vinegar; 1 tsp smoked paprika; 3/4 tsp salt and 1/4 tsp cayenne pepper; blend well. With blender running, slowly add 2 tbsp EVOO and reserved pepper liquid as needed; blend until mostly smooth. Makes 2 cups. Tzatziki Peel 1 seedless cucumber and dice half; set aside. Add other half to blender along with 2 cloves garlic, 2 tbsp packed fresh dill and 2 tbsp white wine vinegar and blend until smooth. Whisk 16 oz plain Greek yogurt with dill mixture, 1/2 tsp salt and 1/8 tsp black pepper. Fold in diced cucumber. Makes 3 cups. Green Goddess Dressing Add 1/2 cup each reduced-fat mayonnaise and reduced-fat sour cream; zest of 1 lemon plus 1 tbsp lemon juice; 2 scallions, white and green parts, roughly chopped; 2 tbsp each packed fresh parsley stems and leaves and chopped chives or dill; and 1/4 tsp each salt and black pepper to blender. Blend until smooth, stopping to scrape sides as needed. Makes 1 1/3 cups. Chimichurri Add 2 large cloves garlic, 1 cup packed roughly chopped parsley stems and leaves, 1/4 cup packed fresh cilantro stems and leaves, 3 tbsp red wine vinegar and 1/4 tsp each salt and black pepper to blender and blend until well combined. With blender running, slowly add 1/2 cup EVOO and blend until smooth. Makes 2/3 cup. If you’re going to have only one blender, go for a standing model. But if you’re willing to indulge in two, get an immersion blender. The biggest selling point? Less mess and fewer things to wash because there’s no transferring—you just stick the blender right into a pot or bowl. Multicookers have won hearts and minds—including ours!—primarily by serving as electric pressure cooker, slow cooker and rice cooker all rolled into one. But they can also sauté (try that, average slow cooker! ), steam and sterilize. Not only do they save time on traditionally long-cooking braises, they’re great for fast recipes like soups, since cooking is mostly hands-off. 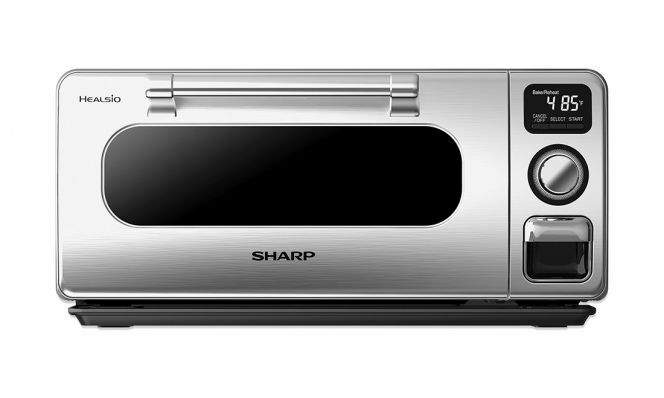 This appliance is awesome because you can completely skip preheating, saving time. It won’t make your kitchen feel like an oven, either, even at high temperatures. Yes, you may know and love it for its wonderful way with toast, frozen pizza and appetizers. But think bigger: In a larger model, you can bake a cake or even roast a whole chicken (see recipe at right). It’s also a handy backup oven during the holidays. 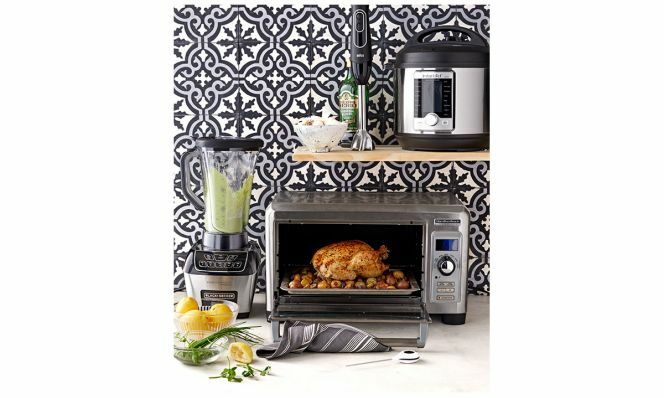 Use the toaster oven and digital thermometer while making our Mustard-Olive Roast Chicken and Potatoes. Use the electric multicooker to make our Instant Pot "Roast" Beef. You use an app to check the weather rather than guessing. So why guess at the temperature of your food? 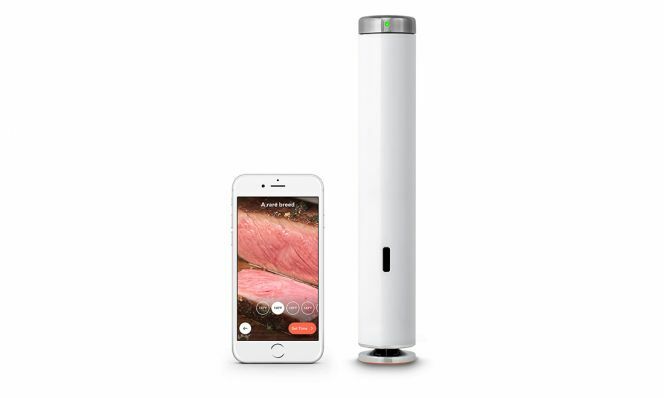 Get an instant-read digital thermometer and a guide to doneness and always have your meat (and eggs and bread!) exactly how you want it. Air Fryer: Yay or Nay? Our short answer: nay. Devotees will argue that it’s easy to use and a good way to avoid added oil. True, but we’ve found that an oven or a toaster oven (especially one with a convection setting) can do the same job. If your curiosity about an air fryer must be satisfied, make sure you get one with a large capacity. Some air fryers won’t fit an entire bag of frozen fries or nuggets—frustrating! Look out, Instant Pot—these devices might become the next household staples. It sounds cliché, but this compact machine is huge in Europe. 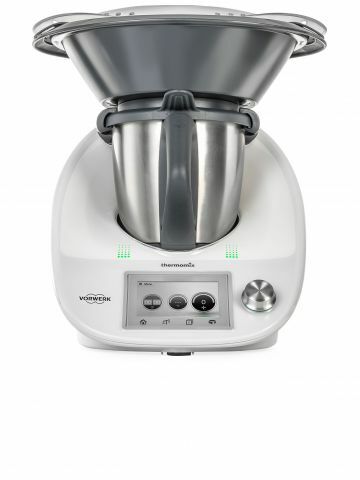 Europeans often have small kitchens, and the Thermomix functions as several devices. The $1,448 price tag is, um, significant. But this German product chops, mills, grinds, stirs, blends, kneads, whips, cooks and steams. There’s also a built-in scale, which works with a recipe chip to walk you through tons of dishes. A circulator lets you cook sous vide (“under vacuum”), the practice of sealing foods in plastic and cooking in a temperature-controlled water bath. Since the temp of the food cannot exceed the temp of the water, you’re able to turn out perfectly medium-rare steaks or jammy soft-boiled eggs every time. Plus, you can leave cooked food in the bag in the fridge, then get it on the table with just a quick sear or grill.